Translation services for the energy and power industry must be clear, concise and accurate. This is most important when the documents being translated are user and reference guides, installation and operational manuals, or technical safety brochures. Ensuring that your stakeholders have accurately translated documents is vital. A single piece of information translated inaccurately could result in an injury to an installation technician or consumer. This is why it is important to use translation services with professional translators who are fluent in the source and target languages and familiar with the energy and power industry. 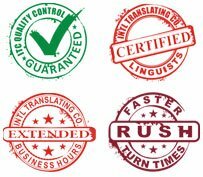 At ITC, we understand the importance of accurate translations that are affordable and delivered quickly. We specialize in providing the energy and power industry, including the growing solar power and green energy sectors, with accurate translations for a variety of documents. They include quality control guidelines, safety and technical specification documents, and installation and operational manuals. We pride ourselves on offering top quality translation services that are easy to order and always delivered on time, making ITC the best choice for all of your energy and power translation needs.